Wow! 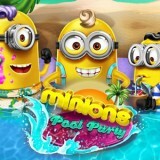 Today will be a real party at Minions! Therefore, your task is to help them in this and make this day the most funniest! Just make them masks and have fun with the Minions. You will succeed!